Discussion in 'General Technical Questions and Answers' started by Goldsmithy, Dec 13, 2018. I am going to start adding electrical accessories to my 05 R52 S MINI. Instead of adding items to the stock fuse block. 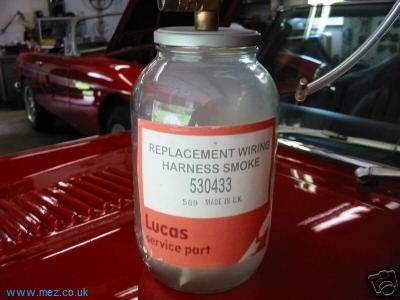 I plan to tap the terminal in the engine compartment and run a 6ga wire, through a 30 amp. resettable circuit breaker, to a fuse block with 4 fuses. I will then tap into this fuse block to add accessories. I want to make this independent of the factory wiring harness. Does anyone see a problem with doing this? I'm not an electrical guru heck not even an electrical hack. I do know keep the + from touching the -. Otherwise the smoke that is contained in the wires will come out. Better get a jar of this stuff. You will be fine as long as you start at the battery and go to a fuse / distribution block. I did this in my car when I added amps for my stereo. Sounds like it will work. What all are you adding? Lee, I'm adding underhood lighting, a radar detector, a DB radio (if I can find one with all the controls in the mike), and a few other thinhgs yet to come.